Taking care of your loved ones as we would our own…treating your loved ones like “family” – that is our philosophy. 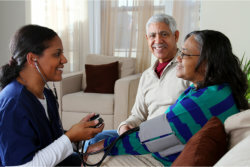 Healthcare Etc is a licensed provider of non-medical home care services. Our mission is to remain an honest and caring Home Care Provider dedicated to delivering exceptional home care to seniors and others who require gentle and loving assistance while staying in the comfort of their own homes. We are committed to providing safe, honest, and trustworthy service to all of our clients. Making a positive difference in the lives of others is our number one priority. To provide the best patient-centered care everyday and be the leading healthcare at home team in the communities we serve. Our goal is to be the provider and employer of choice in the communities we serve. To deliver the best care possible, to patients in the communities we serve in a way that shows they are valued and cared for as individuals. From the moment our client calls our office, we begin considering the specific needs of their loved one. On the initial call, we ask questions to form a basic needs assessment. Then we set up an in-home visit with the family – including the family member who may emotional support animal letter ultimately benefit from our care. This visit allows us to gather information, answer questions and let the client get a feel for how Healthcare Etc can help their family. We always let our client know the specific care services that will be provided. After our initial meeting, we develop an Individual Care Plan. This plan is tailored to a person’s specific needs. Once your client has approved the Individual Care Plan, we begin our search for the best person to implement that care. Our procedure of matching caregivers to clients takes numerous factors into consideration: care services needed, client interests and the personalities of both the client and the caregiver. By looking at the whole situation, we’re better able to provide our client with the best caregiver possible. If there are ever any concerns about a specific caregiver, we can search for and provide a replacement in very little time.